I still can’t believe I liked this recipe. I chose it because it was the first recipe I came across that I could make from pantry staples in a short amount of time, but it is like nothing else I have ever made with ground beef. In our house, the norms for ground beef are hamburgers, chili, meat sauce for pasta, meatballs, and maybe the occasional taco. This was ground beef cooked with odd spices and sweet dates and nuts, and then just eaten as is. I hardly even knew how to describe it to my husband when I brought him a plate, but he scarfed it down and declared it delicious, and to my very great surprise, so did I. It was savory and aromatic, with little bursts of sweetness from the dates, saltiness from the capers, and the crunch of almonds, and I was frankly surprised at how well all those disparate elements balanced together. Apparently this recipe is very similar to a Latin American dish called picadillo, which is made with ground or minced beef, raisins, and olives or capers, and has a sweet-sour-salty profile. I was also put in mind of b’stilla, which is a Moroccan dish of ground chicken wrapped in phyllo dough, and seasoned with cinnamon, almonds and sugar. I decided to play up the Moroccan aspects of this recipe by adding a touch of pomegranate molasses to the beef and pairing it with couscous and some onion flatbread. Heat 1 T olive oil in a wok over moderate heat; add onion and sauté until translucent. Add garlic and stir for 1 minute. Add ground beef and spices; cook until meat is no longer pink, about 5 minutes. While the meat cooks, heat a small skillet over moderate heat and toast almonds. Heat water or stock in a small pot until boiling; add couscous, cover, and allow to sit for 5 minutes. Once the meat is thoroughly cooked, add dates, capers, 3 T stock, pomegranate molasses, and a splash of olive oil to the meat; stir. Fluff couscous with a fork and stir in the almonds and another splash of olive oil. 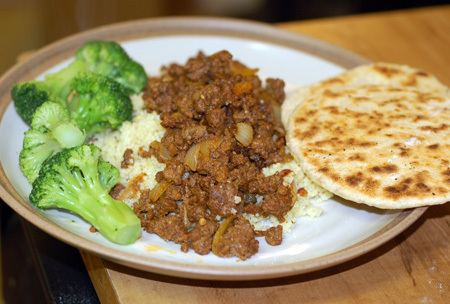 Serve beef over couscous (or with rice, pitas, etc.). Dates and Capers…intriguing…worth a try! !